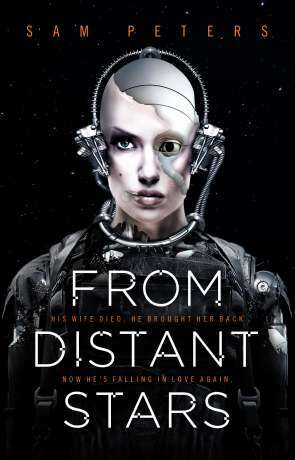 From Distant Stars is the follow-up to Sam Peter's impressive debut From Darkest Skies. Detective Keon Rause has mostly come to terms with the death of his wife five years previously and his illegally created AI Liss has gone - presumably destroyed. He's tasked with investigating the death of military officer Jared Black and three "Fleet" officers ordered to question him at Mercy Hospital on Magenta (a gravity heavy planet where Keon lives). The case stinks of a conspiracy and cover-up. Why would someone kill a seemingly unimportant patient who has been in a coma for weeks in a heavily guarded room? To complicate matters further, the killer appears to have used a military-grade artificial shell to carry out the murders. As the mystery deepens, there appears to be a connection to something buried beneath Magenta's pole and someone who knows more about Keon than anyone alive has any right to. The first book in the series dealt quite heavily with loss, and to a certain degree we still have elements of this message here. While I've mentioned above that Keon has come to terms with his wife's death, it does still feature. From Distant Stars describes and makes use of future technology well, the author having a real flair for describing such technology in an easy to read style. This combines well with a police procedural theme and elements of a thriller lurking in the background. The story is imaginative with plenty of twists, turns and red herrings set against the planet Magenta. Magenta isn't the easiest of places to live. The heavy gravity, constant rain and fierce wind storms that can last for days. The planet is named after the colour that the dust that coats land and water. We get more background to Keon, his past life and a great deal more about his wife. Then there is the relationship between Magenta and Earth - which seems somewhat contentious. I love the backdrop of an alien race having restructured our solar system before abruptly disappearing, leaving behind their avanced technology. Sam Peters writes well, combining a crime / thriller novel with some imaginative future tech that has real uses - not to mention an examination of advanced artificial intelligence. The plot is clever and immersive, as is the world building. From Distant Stars is a fascinating, rewarding novel that merges the best of science fiction and crime - highly recommended. Written on 1st June 2018 by Ant.